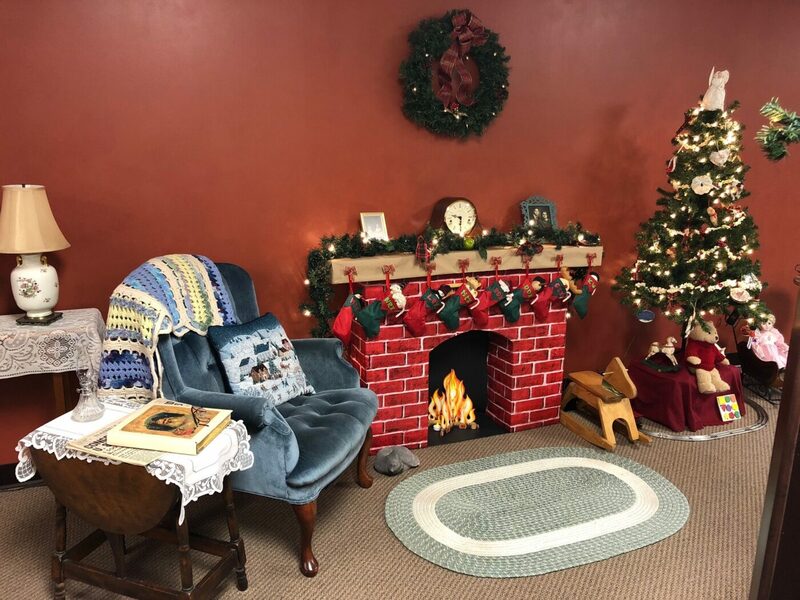 Nashua, N.H. – Over the past two weeks, the employees at Eaton & Berube Insurance Agency on Concord Street have been getting into the Christmas spirit for a good cause. The agency kicked off its inaugural Christmas Decorating Contest to transform the necessary task of decking the office halls into a friendly competition that supports our local community. To supplement the office’s existing decorations from years past, the agency provided each of its three floors with a small budget to purchase new decorations. The employees then enjoyed the freedom to decorate as they desired, aware that their next door neighbors at The Front Door Agency would judge the contest. Decorating styles ranged from elegant to vintage to a colorful Candyland theme, and on Dec. 7, judges from The Front Door Agency crowned Eaton & Berube’s main floor, the Personal Lines Department, the winner. The winning floor opted for a vintage theme that transported you back in time, centering around a cozy fireplace scene complete with genuine relics from the past, including a copy of “The Night before Christmas” from the late 1800s, framed black and white photographs of grandparents from their youth, and historical pages of The Nashua Telegraph from 1941. Fireplace scene on the winning floor, Eaton & Berube’s Personal Lines Department. To view additional photos of the entire office, please visit our Facebook page. 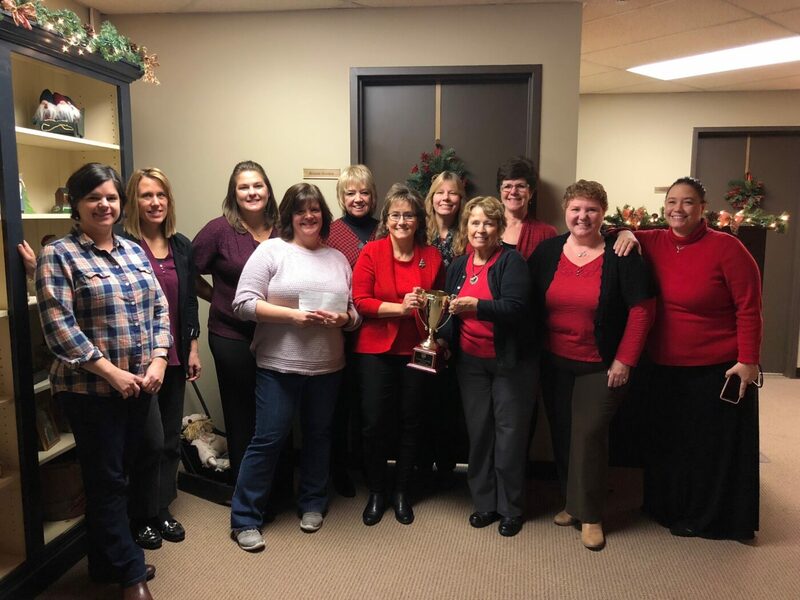 Front Door Agency Staff Members (L-R) Kara Reeves, Jean Perry, Cindy Enright and Nancy Paige, with Eaton & Berube’s Winning Floor Team Members (L-R) Marty Thebodeau, Nancy Roy, Lisa Blais, Debbie Donnellan, Karen Proulx, Brenda Gordon, and Gwen Storey. Missing from Photo: Mike Carr. Second place was awarded to the basement floor that chose a classic, elegant style featuring an abundance of lights, garland swags and sparkly bulbs hung from the ceiling, and a plethora of presents. The top floor, Eaton & Berube’s Commercial Lines Department, took the third place trophy for transforming their space into Candyland, complete with a hand-crafted Gingerbread house entryway, gum drop tree, and café full of holiday-themed sweets. Each employee from the winning floor received a gift certificate to Stella Blu on East Pearl Street. To their surprise, all of the remaining employees received a gift certificate to California Burritos on Factory Street for their enthusiastic participation. The grand prize, a $500 donation, was awarded to The Front Door Agency, the winning floor’s charity of choice. The charitable gift coincides with Eaton & Berube’s annual agency-wide fundraising initiative to supply grocery store gift cards for the Front Door Agency’s holiday program. Eaton & Berube’s office halls will remain decked through the end of December and the agency welcomes community members to stop by to view and enjoy the decorations. Eaton & Berube is located at 11 Concord St., Nashua, N.H. 03064, and can be reached at 603-882-2766 or info@eatonberube.com. The agency’s office hours are Monday through Friday, 8:30 a.m. to 5:00 p.m., with the exception of Wednesday, Dec. 20, when the office will close at 12:00 p.m. for its annual holiday party. Click here to view all photos from our Christmas Decorating Contest on our Facebook page.